Pakistan is one of the most vulnerable countries to climate change in the world. It is the world’s sixth most populated nation, however, a significant portion of its citizens remain oblivious to the magnitude of the challenge that we face. 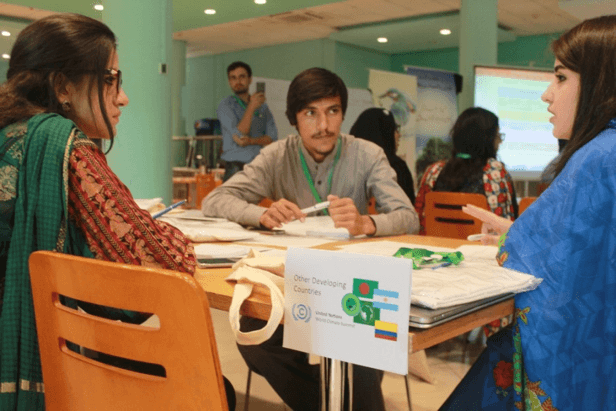 In order to bridge this gap of knowledge and action, I started COP in My City Pakistan (a local chapter of the international youth project, Climates) in partnership with the Ministry of Climate Change and the Friedrich Naumann Foundation of Freedom. We organised a two day World Climate and World Energy simulation workshop for university students from across Pakistan. 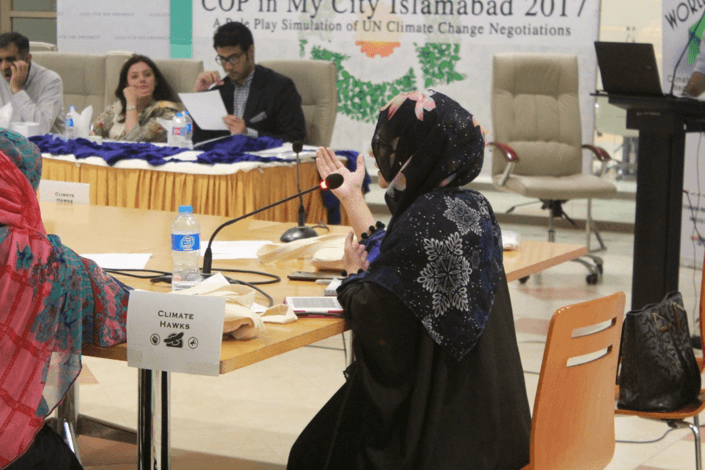 “COP in My City Islamabad 2017” took place on the 14th and 15th of October 2017 with around 50 participants from 22 universities representing diverse academic backgrounds from law to environmental science to business, and from undergraduate, graduate and doctorate levels. The simulation was structured in a competition style with the participants being judged by a number of experts on their negotiation skills. 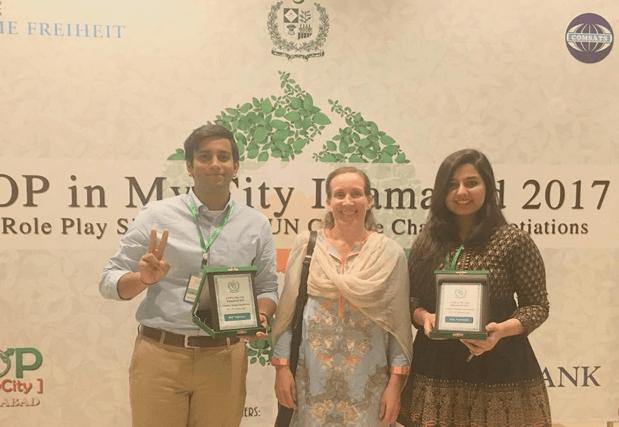 My team was instructed by the Ministry of Climate Change to put together such an event to mobilise Pakistani youth on Climate Change as a lead-up to COP 23 in Bonn. Two of the best performing participants would be sponsored to attend COP 23 alongside the national delegation. I first came across the World Climate and World Energy simulations during my junior year at college while searching for ideas for an interesting class activity for a sustainability course. Even though I was unable to run the simulations at that time, they gave me an idea for a grand event for university students to raise awareness about climate change and mobilise them towards climate action. 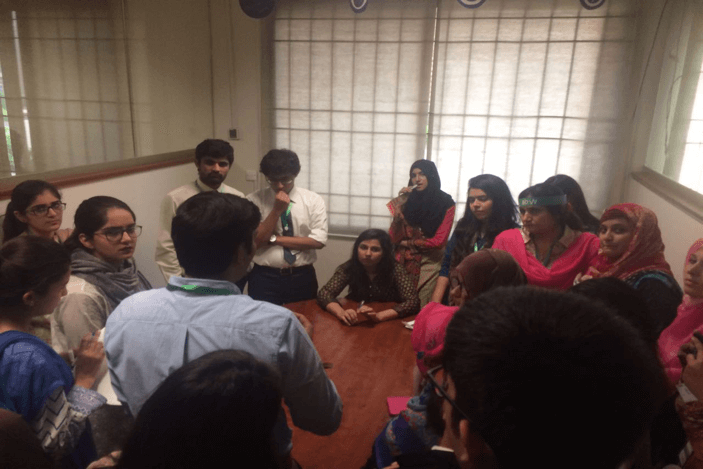 Since, this was the first simulation in Pakistan, we anticipated that participants would be understandably uncertain and a bit confused about the purpose and format of the simulation. In the weeks preceding the actual event, we assigned participants different negotiating blocs/regions for World Climate and World Energy simulations and sent them the briefing statements. In order to contextualise the simulation to the local context, we added another negotiating bloc of Pakistan to the mix. The event began with a brief opening address by Pakistan’s Federal Secretary of the Ministry of Climate Change, who highlighted the importance of climate change action and the role of youth in this process. 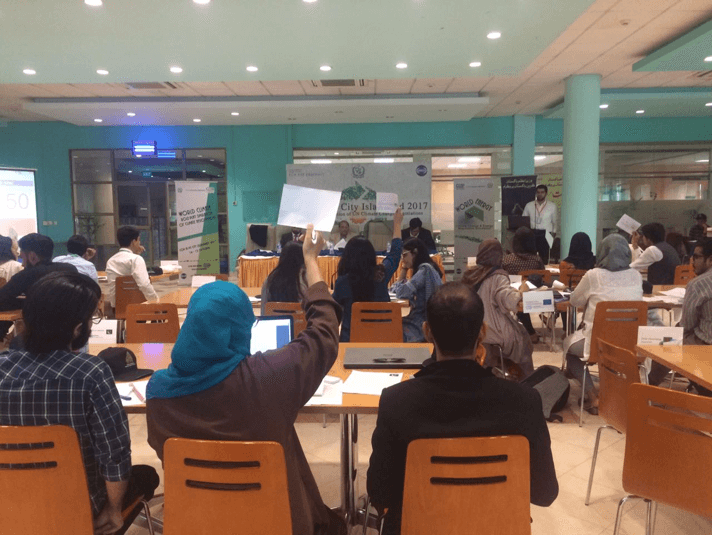 Participants were then provided a comprehensive overview of the World Climate simulation and given detailed instructions on the rules and structure of the simulation. Amidst all the excitement and ambiguity leading up to the event, it was great to see participants quickly settling into the role-playing mindset and actively engaging with their fellow negotiators in discussions regarding their positions and negotiating points. What followed next was two days of intense debate, fluctuating emotions, solid arguments and a heavy dosage of climate change jargon that not many were familiar with until recently. Despite many students having little or no prior knowledge of climate change and the UN negotiations, it soon became apparent that everyone had carefully read their briefing statements and thoroughly researched the positions of their respective countries/blocs. After a long and tiring first day of intense negotiations with sessions of plenary statements, moderated and un-moderated negotiations and final pledges, the parties were able to limit global warming levels to an ambitious 2.3 degrees Celsius, which was further reduced by another 0.2 degrees in the final round of negotiations on second day. The simulation undoubtedly, turned out to be a great success and arguably proved to be a far more effective and exciting tool for communicating essential aspects of international climate negotiations compared to some sort of a lecture series or conference which would not have been half as interesting as this. Organising and moderating the World Climate and World Energy simulations, has been one of the most rewarding and great-learning experiences of my life. Not only did the participating students get educated on various aspects of climate change such as adaptation, mitigation, Green Climate Fund etc., I personally found the exercise to be extremely useful to learn about unique perspectives on existing issues from people belonging to different fields. The whole experience has also strengthened my commitment to exponentially increase efforts to promote the World Climate simulation in small communities throughout Pakistan and to educate the youth and encourage them to initiate projects on climate change that are both meaningful and transformative in their own capacities. The following are some of the experiences shared by the participants as shared in the post-surveys. “It made me feel like I was actually advocating for the countries I was assigned to and I felt empowered in a sense that I actually can or might be able to make a difference in something so important, globally.